This book is an in depth biography of Joe Sinnott (wiki). It details the literally the whole life of Joe Sinnott, right from when he was a kid to the work he does after his retirement. There's and incredible amount of interesting information on the legendary inker. While in school, his instructors were Silas Rhodes, Burne Hogarth and Tom Gills! There is also story on how he got to know Stan Lee. His impressive portfolio of comics and inks fill the book. Some titles include The Avengers, The Defenders, The Mighty Thor and The Fantastic Four. His career at Marvel, relationship with Jack Kirby and other artists and work of different projects are given a really detailed treatment. What I like about the book is there's coverage on the different people in Joe Sinnott's life. It really gives depth to what kind of person he was. There's also a chapter containing 19 pages where friends and colleagues talk about him. 19 whopping pages! It sure says a lot about his legacy. 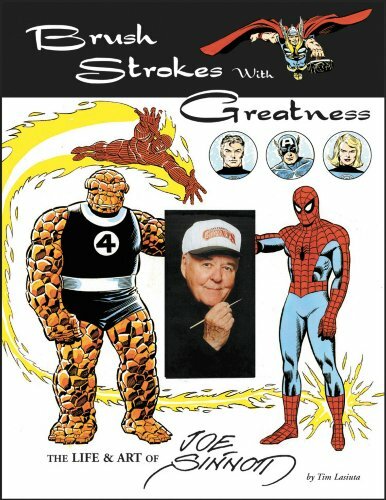 This is a wonderful tribute book to Joe Sinnott. Highly recommended.